The phrase father knows best simply isn’t always true. Speaking for myself, my Mama knew best — and to this day, she still does. That’s why I fell for this book upon reading the title. 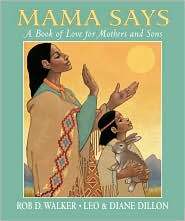 Mama Says: A Book of Love for Mothers and Sons uses simple prose and stunning art to create a powerful tribute to mother and child. Practically spoken from my own mother’s mouth! Once again, the Dillon’s rocked. 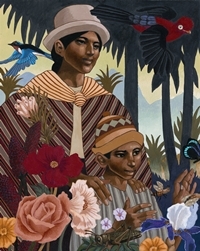 The art is bold and detailed, with patterns and environment representative of each culture. There’s a quiet simplicity about the book, with an ending that will warm your heart (spoiler warning). The final spread pictures a gathering of men from every corner of the world, from Black to White and every shade in between, dressed in their native costume — boys who listened to their mothers and grew up to be men, pride radiating from their faces. It’s really a powerful spread. Translations included: Cherokee, Russian, Amharic, Japanese, Hindi, Inuktitut, Hebrew, English, Korean, Arabic, Quechua, Danish. It’s not just a book for boys, but I wouldn’t be surprised if a book for girls is on the horizon. Note: Our mission here at the Brown Bookshelf is to spotlight books by or about African Americans, with an emphasis on authors or illustrators who may have been missed by teachers and librarians. So, I know what you’re thinking (because I’ve heard some critical feedback): But the Dillons are widely known, major award winners. I agree. But our mission here isn’t to exclude the biggest of the big names. In addition, aside from the fact that I truly loved this book, it made our humble spotlight here because the Dillions’ publishers sent a copy of the book to me. It’s much easier and more convenient to report on a book if I have it in my hand. I love children’s literature, so I will go out of my way to find books and authors to report on, but when my illustration schedule is full (like it is now) and it’s my turn to write a blog post, I’m likely to turn to the stack of books sitting right next to me, sent by authors, illustrators or publishers. Sounds like a beautiful book. Look forward to reading it. i read this book with my two son’s at the libary and we loved it.